Groping and kissing journalists reporting live from different places have almost become a norm. Recently there has been a steady increase in such incidents with most of the victims being women. From being touched, groped, kissed, videos of women reporters being molested have gone viral multiple times in the past. It is such an irony that those who report molestation cases and violence against women have to themselves face it in the process. These incidents should not be pushed down as examples of consentless incidents, but shows the sick mentality of people. It is a basic understanding of letting people do their job in peace and if that sounds strange, then these people need to get their morality checked. The latest such incident occurred when a Bulgarian boxer kissed a women reporter during the post-match interview. While women are mostly the victims of such incidents, there have also been cases where men had to go through such ordeal. New Year's Eve 2019 Midnight Kiss Video Goes Viral: Dutch Man's Awkward Attempt to Get Kissed Irks Twitter. Vegas Sports Daily reporter Jennifer Ravalo said she was left "embarrassed" after Bulgarian heavyweight boxer abruptly ended the post-match interview by forcibly kissing her on the lips. The video went viral leading to social media outrage with people questioning if the boxer knew how to respect women. Julieth Gonzalez Theran was live reporting on 2018 FIFA World Cup from Russia for German TV news channel Deutsche Welle when a man passing by stopped and kissed her. Julieth shared the video on Instagram with the caption, "RESPECT! We do not deserve this deal. We are equally valuable and professional. I share the joy of football, but we must identify the limits of affection and harassment." Journalist Julia Guimaraes from TV Globo and SporTV in Brazil was reporting on a soccer gamer outside Yekaterinburg stadium in Russia when a man tried to kiss her. The reporter became furious and rebuked at the man saying "never do this again". As she asks him to respect women, the man can be heard apologising to Julia off-camera. 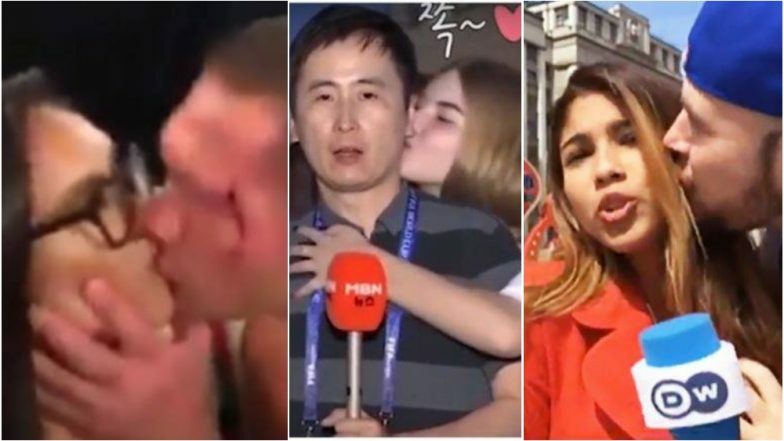 Two women walked upto a South Korean journalist reporting on 2018 FIFA World Cup and kissed him. The incident garnered a lot of criticisms with people demanding action against the women. However, the Korean reporter laughed it off. Swedish reporter Malin Wahlberg was forcibly held and kissed by a man, while presenting live coverage of 2018 FIFA World Cup venue for Deutsche Welle. The incident had sparked a lot of anger and fury from social media users, however, the man said it was a misunderstanding as he only meant to touch her shoulders. Such incidents of reporters facing harassment while doing their job are quite high at sports venues. Reporters in different countries around the world were groped, touched or kissed while covering football matches live. While these incidents garner fury on social, it has never translated into a rule against such miscreants. It is high time we need to learn to respect people and maintain dignity.